Veteran singer-songwriters Larry Gatlin and Aaron Tippin will be a big part of this year’s CMA Songwriters Series during Tin Pan South week in Nashville. Gatlin and Tippin will perform during a special writers round set for Tuesday, April 3 at 6:00 pm at the Station Inn. 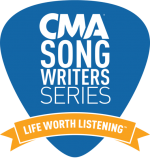 Hit songwriters Charlie Worsham and Terry McBride will also be featured during the round. Gatlin adds, “I’m really lookin’ forward to doin’ a little pickin’ and grinnin’ with Aaron, Charlie, and Terry. I love to hear great songs… maybe this old geezer can contribute one or two.” Festival pass holders will be admitted first, with tickets sold at the door for $15 as space permits. The Station Inn is located at 402 12th Avenue South. The close family harmonies of Larry Gatlin & the Gatlin Brothers have given the trio a signature sound that led to country classics like “All The Gold In California” and “Houston (Means I’m One Day Closer To You).” The brothers won a GRAMMY® for their 1976 breakthrough hit, “Broken Lady,” and reached #1 with several other songs soon thereafter. Along with five career nominations for the ACM Vocal Group, the Gatlin Brothers picked up three 1979 trophies–Single of the Year (“All The Gold In California”), Album of the Year (Straight Ahead) and Male Vocalist of the Year for Larry Gatlin. The brothers were also nominated for multiple CMA Awards. Larry Gatlin has written songs recorded by Elvis Presley, Glen Campbell, Barbra Streisand, Johnny Cash, Kris Kristofferson, Dottie West, Roy Orbison, Barry Gibb and countless Gospel artists including the Gaither Vocal Band, the Booth Brothers, the Isaacs and many more. After 63 years of music, the brothers continue to perform nearly 100 live concert dates each year. Country Music News Blog participates in advertising programs that help fund the operation of this site. For more information please visit our privacy statement. This entry was posted in Aaron Tippin, Community by Shauna "WhiskeyChick" Castorena. Bookmark the permalink.